The documents suggest that the tokenisation of a language into word units is not as simple a matter as we might assume. In the Franks Casket inscription, the carver has carefully inserted points after the first and second words – f i s c . f l o d u . – but after that, he seems to give up and there is no further word division (some sort of pointing exists after a in gasric, in the reversed runes of the bottom line, but its purpose is obscure). The Corpus Glossary and the interlinear glosses in the Vespasian Psalter presuppose the division of the text into word units, and the Corpus scribe has scrupulously added interword points in many places, but some ambiguity is still possible: the Old English gloss for Latin strigillus reads ‘Aera . Aerenscre/op’, with a point after æra but none between æren and screop, and screop divided in the middle of the word when the scribe runs out of space on the line. (The Latin term is a word for a scraper, later a curry-comb in popular Latin; the Bosworth-Toller Anglo-Saxon Dictionary lists Old English æren and screpu as separate words.) 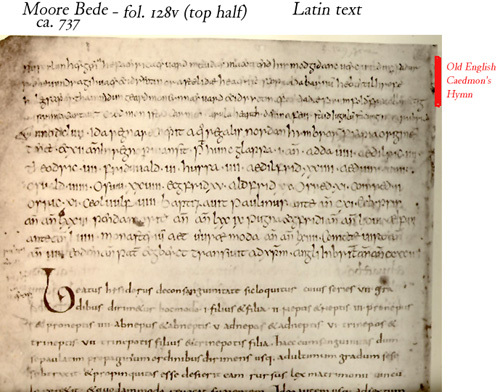 And the scribe of the annotation in the Moore Bede cramps his writing so much that it is hard to tell if he is bothering to separate the English words (his Latin word separation isn’t great either). In the continuous texts – the poems on the Franks Casket and in the Bede manuscript – word separation is less important, because those texts are scripts for speech. Spoken language does not divide itself into words, at least not in the ways we expect if we are used to thinking of words typographically, as strings of letters bounded by white space or punctuation. Word separation, with points or spaces or both, is much more consistent in the two glossed texts, but this makes sense when we remember that both attempt to correlate Latin and English lexically: that is, bilingual glosses and glossaries match word units in different languages. The Old English text in the Vespasian Psalter looks continuous, but it isn’t really, since its direct correlation with the Latin beneath it forces the English to follow Latin word-order rather than English syntax. The reader is expected to follow the Latin text, jumping up to the English gloss whenever he needs a translation, then going back to the Latin. I’ve rambled on about these issues a little bit in previous posts, but the questions surrounding early English word separation seem complex and intriguing enough for a case study. At the very least, we can observe that early English word separation seems to arise in situations where a text is not intended as a representation of speech but more as a representation of information. I’m also interested in what early English word separation implies about the processes and practices of reading English in the early Middle Ages. The detail image of the first line of Cædmon’s Hymn in Cambridge University Library MS Kk. 5.16 is from the facsimile in Daniel Paul O'Donnell, ed., Cædmon's Hymn: A Multi-Media Study, Edition and Archive (Cambridge: SEENET and D. S. Brewer, 2005). I hope I may be forgiven for its use. The other images are publicly available on the Web: click on them to view their sources.